Could EMC compete with Cisco after VCE deal? 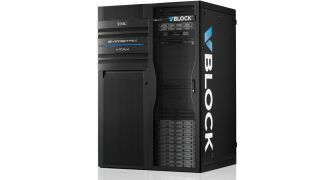 EMC has confirmed that it will take full control of VCE, the converged infrastructure joint-venture it had set up with Cisco and VMWare. Cisco will still own about a tenth of the business, down from 35% but could well face some serious competition from a unit it set up. Praveen Akkiraju. VCE's CEO, noted in a blog post, that the $2-billion company is looking to "expand beyond platforms to deliver hybrid cloud solutions". Cisco has already started to compete with VCE via its Unified Computing System servers. However, its CEO, John Chambers, confirmed that the company would continue its "commitment in VCE as a crucial route to market for Cisco's next-generation technologies for the data center and cloud." The current scenario is reminiscent of the LenovoEMC joint venture, one that eventually saw an EMC-owned entity (Iomega) being controlled by Lenovo. Both shares of EMC and Cisco jumped earlier today in pre-market transactions by about the same amount (around 1%), a sign perhaps that investors on both sides believed it was a good time to call off the JV.